What has changed over the years to make us thus? In truth it is probably a mixture of brainwashing from a partisan media, a nagging uncertainty about the future ownership of our club and the result of a diet of success that was far too rich for our own good for several years. Here and now, every Arsenal supporter should ask themselves why they became a supporter in the first place. Was it to complain? Perhaps to facilitate writing abuse on the internet? Maybe it was to indulge in jeering the home team from the home supporters section. Maybe, but I suspect not. What I suspect is that you became an Arsenal supporter out of love and passion for the club. It was this love and passion that caused you to put everything else on hold come match day. It was this love and passion that caused you to spend your hard-earned cash to see your team play live. It was this love and passion that allowed you to savour victory and success to an opiate-like degree that eased your pain when that success was fleeting, as it so often is in football. It is now time to remember those things of yesteryear that sparked our love affair with this magnificent football club and realise that they are just as strong in us today as they were then. Complaining about our situation will not change it and the events of this year and others cannot be undone. NOW is the time to unite behind our manager and behind our team. It is NOW during this bleak period that they need our support the most. We are their twelfth man but we are not match fit anymore. Let’s have an end to all these ridiculous calls for Arsene Wenger to be replaced. He is going to be our manager for the foreseeable future so get behind him. When he eventually retires, he will greatly missed believe me. Let’s also have an end to the incessant calls for him to buy players. OF COURSE HE IS GOING TO BUY PLAYERS! Not only that but he will buy the best players he can lay his hands on with the money he has available, which will most likely be substantial this year even though it hasn’t been in recent years. On top of that, when he does buy these players, make them feel welcome! Make up great songs about them, send them welcoming messages via the club and go and see them pre-season singing yourself hoarse in the process. Wear shirts with their names on the back. Show them that they belong and they will play their hearts out for you. This season coming, RENEW YOUR FAITH IN THE ARSENAL! Wear your colours proudly! Drown out the voices of other supporters whether home or away with your singing! Roar your applause at every shot on goal whether it goes in or to row Z! Roar your applause at every substitute warming up and let them know that you are behind them and that their best will always be good enough. You will see more of their best as a result. Increase your support to include the reserve matches, the youth games and our fantastic ladies team who are a national treasure. Go to their games come rain or shine! Break their attendance record until they have to put their matches on at The Emirates because they deserve to play there and they deserve you to be there for it. Make other supporters and other teams feel awe for the support that we give our team. Make the Emirates atmosphere the envy of the league! Lift our players and they will do their part and lift trophies. Raise your voices, lift your team and renew your faith. Unity in the face of adversity. C'Mon Arsenal!!! We're behind you! Arsenal Till Death Do Us Part!!! I agree with what you're saying anon. However, I don't you can expect fans to be able to afford to go to every games. I think it's a disgrace that they're apparently cancelling Cannon Club. My last junior Gunner Season has just finished and I cannot afford to trek out 40 quid 5 times, never mind 19+ for every match I see. Bearing this in mind, YOU'RE PAYING 40 QUID!! Why no make the best of it? Why not get behind the team? Why not shoout and sing to the rooftops? Why not help to give yourself the best experience possible? Imagine if you went to a Stand Up of a comedian you love. Say he told a few jokes you didn't like or thought were poor compared to normal, would you groan at him, not laugh at his top quality jokes (e.g. not praise the signing of Arsavin), leave early? I think not. Well said ... forget the negativity... just forget it... think it never happened and lets look ahead and hope for the best... if our team needs inspiration then we should be there to provide it throughout the season. the huge problem with this club and its supporters is, their dependence of Mr. Wenger - the over praise and of late the embarassing fans begging for him to stay. It infuriates me that the narrow minded only see our club survive/exist if Wenger remains. 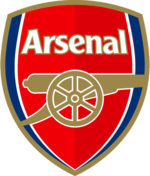 I love Arsenal, I have since i was 4, and i am a 42 year old man. Some of the problems of the club is, we seem to have forgotten our values, what makes us the club we are, the club known as the "Bank of England" - traditional, historic virtuous and always forthright. Its seems like the new found fans dont remember or forget the club of the 30's, 70's, 80's and 90's - under the stewardship of Chapman, Mee, George - we won trophies we were successful all before Wenger - and not once do i remember any supporters embarassing themselves by begging on public forums and perhaps in person for a manager to stay. No one man is bigger than the club - that includes, players, manangers, directors - the fans are what shape this club. So here is another open letter to open fans - speak up, speak of your dissatisfaction, dont give up your club and lose its virtues - remember the values what makes Arsenal great - we have won things in the past and we will win things in the future, with or without Wenger. Hello! I doubt any true arsenal fan will criticise just for the fun of it. Fans will always be fans. They have a right to make noises. They ALL want the club to do well and win trophies. This is the same for every football club .. unless they are dummies. And I bet however much they complain, at the end of the day they still love and stay with the club .. even when arsene wenger eventually leaves one day. I dont think it is a matter of being ungrateful. It's a shame, even childish, to label your supporters as such....because without them, what is the club really. Meanwhile, it's good to close ranks and look forward to the next season, of course hoping we will see great players added to the team and win titles again. There is money available but only because of boardroom politics, wenger gets only a miserly 13million pounds. You wonder if those in the boardroom really love the club sometimes..o or if they keep their promises. WARNING: Bit long this one! Well, like Cookie, I also have been an Arsenal supporter for a long time. I can remember seeing games with Fumbling Jim Furnell and a centre back call Ian Ure who must have thought about changing his name to Urine as he had the piss taken out of him so many times. 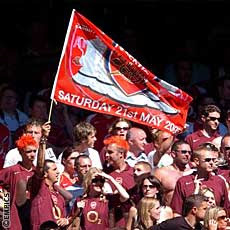 And then there was poor Jon Sammels who suffered unmerciless torment from the Arsenal faithful. So, poor treatment from Arsenal supporters has a long history! Now, I have never lost my faith in Arsenal. It's part of the reason that we are football supporters. Or fans, short for fanatics. When our team is playing, we don't inhabit the real world where normal rules apply, we exist in this somewhat surrealistic parallel universe where all is possible and even if we wind up with nothing, there's always next season when we all start off even again. Off on a tangent perhaps, but this little anecdote make help illuminate what the game and Arsenal football Club means to me: I was living down near Portsmouth when Alan Ball was their manager. I loved Bally. For 1966, for wearing the Arsenal shirt. After an amazing game where Pompey smashed Leeds 5 - 1 if I remember playing the type of football that would not have been out of place under Wenger in the best of years. I wound up in the club bar after the game and who should be there but Alan Ball. I wouldn't speak with him as there was nothing he could have said or done that could have added to the esteem that I already felt for the man. In fact, anyone who has ever heard Alan Ball speak would realize that it might have taken something away. It's not logic, it's just feeling. I share the frustration of most Arsenal supporters and I certainly wouldn't beg for Wenger to stay. But, if anyone can suggest a better manager for this club, I would love to hear the name. I don't want the relationship with Wenger to end like Clough's did with Nottingham Forrest. For all sorts of reasons, it won't happen. But I believe in this team, I believe in this manager and, strangely enough, I believe in the directors. But, as in all things in life, only time will tell who's right. And it's not about why you became a supporter, it's about why you stay a supporter. If you have been supporting Arsenal as long as you claim, you must have stood on The North Bank during the 70s and 80s watching Arsenal win nothing and produce crap football to boot. I know I did. But what made it all worth while and what kept me going back week after week was the fantastic atmosphere. 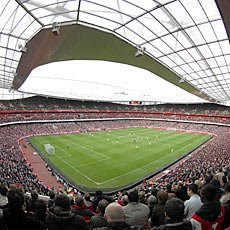 Ever since The North Bank became all seater the atmosphere has got steadily worse and since the move to The Emirates has become embarressing, but now it's the fantastic football that keeps me going week in week out. If Wenger goes we will be left with zero atmosphere and inferior football, I guarantee it. So get busy sing up! All very good arguments and the underlying truth is that we all want our club to be the best.We have the best ground, we have 1 of the top 2 managers in the world yet we are 4th in PL and the europe so whats missing to make us the best. The answer is to look back at Man U.They went 3 seasons without trophies then along came the Glaziers with THE MONEY, Furgeson then did his job,spending their money bring in 20 million pound players and buiding the best team. With all due respect to your blog, if you insist upon "reproducing" sombody else's work from another blog, you could at least acredit the original source rather than representing it as a contribution to your own. This would be the 4th blog that reproduced this as an original contribution. Here is the ORIGINAL unedited article. I know this because I wrote it. For fucks sake you are all being conned.I love Arsenal i love the idea off Arsenal being successful nothing gives me more joy when we are competitive but when several members of the Hierachy i.e. our manager and chairman are telling me porkies i react in disgust and i vent my anger and frustration at several blogs this is my right but when my club starts to edit footage from a very hostile GM like it was the old Soviet i have had enough.Ask yourself why you walk you dont walk for Arsenal you walk for a manager that has told you porkies for a very long time you walk for a board that is so introvert you would believe they were snails....remember this and remember you dont walk for Arsenal,i wouldnt take a step!!!! Excellent post. We have to support our club and Arsène has been with us through thick and thin. He's worked on the crappy budget the board have given him and done very well for the amount of money we've spent in comparison to the other top 4. Let's get rid of the old "Arsenal stadium is a library" banter and show them what atmosphere is all about. You saw what we did in the first 7 minutes of the CL at home vs. United. We need every home match to be like that. We all follow the Arsenal! yes that is what I am talking about - i support Arsenal, not Arsene Wenger - to some extent, the lies he tells the fans, the dissatisfaction in his tactics, buying and selling of players or lack of, stinks of high heaven. He lies and the "Arsene Knows Best" brigade buy in to it all the time. To compare Wenger to Clough is disrespecting Clough - Clough never lied to the club/fans, he was a character a lovable character by all fans and clubs. I can also name other managers who can do a better job then Wenger - Ancelloti, Mourinho, Ferguson, Rijkaard, Van Basten. Anyone tell me what Wenger has done that has revolutionised football? If anyone says he was the brains behind our move out of Highbury - i would respond by saying - I bet close to 95% or even more fans would rather we stayed at highbury, so moving is no big thing, other than putting our club in serious jeopardy and the purpose of moving was to compete financially and to play the game Wenger envisaged. Well heres another newsflash - since moving to the Emirates, we havent won a trophy and we cannot buy any players of quality of substance. Great article. Thanks to Arsne we have and continue to punch above our weight. Now this is not a complaint but a truth. if it is a fact that he has only £13mil to spend in the summer than he is truely a man of integrity. Beneitz would be screaming blue murder at the board. But not Arsne, he gets on with the job at hand with style, grace and passion. yes we need a few players in key positions, but doesn't every team. If Arshavin was available and Gallas, Clichy where fit our season could have been so different. Our beloved Arsenal deserve our support. My dad used to take me to Higbury in the days of Sammie Nelson (he who moonied to the crowd), Willie Young and Peter Radford (great palyer). Who would of thought we would be one of the best teams in the world. We are The Arsenal - and nothing else matters! Amen. Some of the fans behavoir is bordering on disgraceful. There are people all over the world who would give an arm and a leg to see Arsenal play at the Emirates. Grow up arsenal fans, and if you feel frustrated or angry, why not channel that emotion into singing your lungs out for your team. how quickly we forget, this is the manager that created the invincible’s, that team will go down in history, i know it's in the past now, but that was Wengers team, now he is building a new team, not just for a season of success but one that can improve year after year as they play together. If he was to leave i believe within 5 years we would drop from the top 4 to more a top 10 team. Have faith in the man. To be where we are in world football, who's responsible for that? one man Wenger. Take a step back and see how lucky we are. Last time I visit this page. Very poor analysis and rating. Too much moaning. And stealing. I've read this post from Untold Arsenal of Tony (Author : Terence McGovern), and I think you just need less than 2 minutes to figure out this and give him credit when you repost at your blog. If you can't write down anything, just dont do this. The impatient ones who sneered at Arsene are only fans of the club's success..